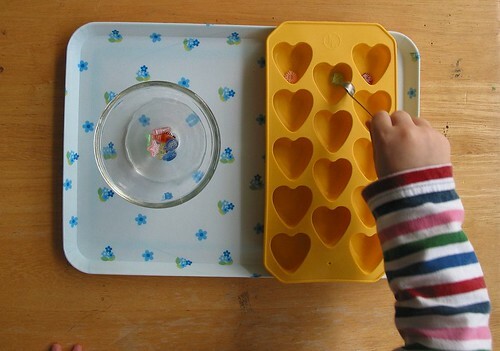 There are a *huge* number of practical life skills that you can teach your children. You just need to think about all your own day-to-day work around the house and at your workplace to begin to get an idea of what skills your children will eventually need to have. 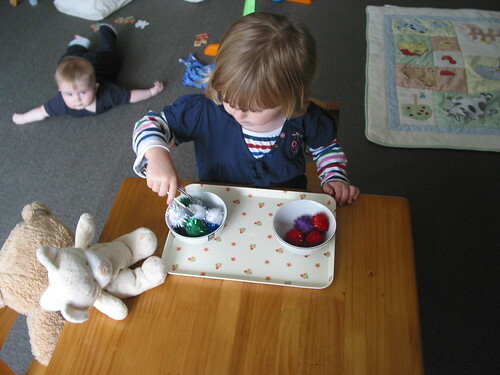 Today’s activities are but two more towards developing the manipulative skills necessary. Using the wonderful check-list created by The Home Teacher on her blog here, I have been tracking and making sure that I cover as many basic skills as is sensible in our household. It is quite astounding what we have managed to introduce since October last year. In the manipulative skills section Miss Oh has been introduced to 30 of the 40 activities and is proficient at 13 of those. Today’s activities are simple transfer games using a very small spoon and a small pair of tongs. This was a very simple activity, following on from using our big kitchen tongs, then on to our tiny tweezers, we came back to a middle ground and found a great pair of kid-sized tongs for her to move craft pom-poms from bowl to bowl. Ideally she would be learning to use the pincer grip while doing this, but I’m happy for her to be working on her overall hand strength just now. She is now using the pincer grip on pens for writing, so it will all play in together as she uses her hands more in this way. This was accomplished using our “dash” spoon and the tiny seashore beads that I purchased for Miss Oh to enjoy using and finding in her sand tub. 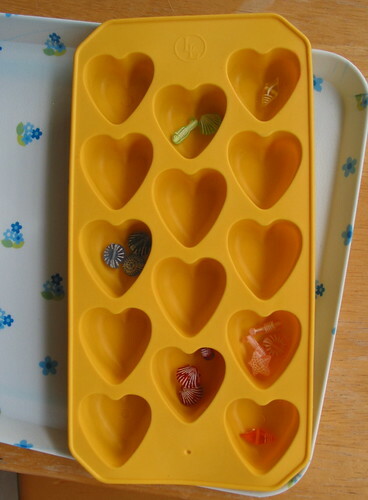 There were enough beads to place one in each heart compartment of the ice cube tray. Miss Oh had very little trouble after her first few attempts to scoop up the small, awkward shaped beads with a small, awkward sized spoon. She completed the activity as I had shown her – one bead per cube. Then when she was finished and I was walking past I suggested she pick out the blue ones back into the starting bowl. Instead, this is what she chose to do. Yes, she sorted them by colour. It was terrific to see her mind working on the classification possibilities. Now to complete my amazement she only has to sort them by type of bead (scallop, seahorse, etc). But I won’t be holding my breath on that one happening just yet. So, what’s been happening in your household lately?